Trampolines can be extremely fun, and a great source of exercise. However, trampolines can also cause serious injuries. Please take caution while participating in trampoline activities such as these extremely fun 2 person trampoline games. This game requires at least two people to play. It is one of the most classic trampoline games around. The object of the game is pretty straightforward. The last man standing wins. Before the game begins each player should jump around a few times to warm up. When it is time for the game, every player must drop onto their backside and jump back up landing on their feet. The catch is that you are only allowed one bum drop and one-foot jump per player. Anyone who doubles up either move is eliminated and the other player automatically wins. This game is much like the basketball version, but with a super cool trampoline twist. It, of course, is an ultimate challenge against your opponent that concerns using trampoline tricks. Before you begin the game flip a coin to see which player goes first. Once this is established, the first person must call out their intended trick, which they must land perfectly. If the first player happens to land the trick the next player must copy it. If either player misses the trick than a letter is put onto their score. The first player to spell out horse loses the game. Do you like basketball? How about trampolines? Why not combine both with this classic basketball trampoline game. By using the rules of horse add a twist of fun by performing tricks and plain bouncing while you attempt your baskets. When a player happens to miss a basket, add a letter to their score. As with other versions the first person to get all five letters loses. This is one of the extremely fun 2 player trampoline games for players of all ages. 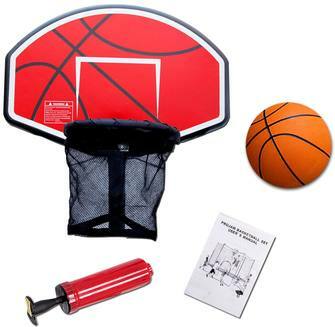 Click here to check our trampoline basketball hoop attachment guide and pick yours. When you're playing on your trampoline, why not challenge your friends to a dance-off on the trampoline. This game could be fashioned around other dance-off type games like on video game consoles. You could even gather a panel of judges to cast votes on the best dancer. This is actually one of the most interesting trampoline games, is also a lot of fun. The object of Turtle and Hare is simple enough. The turtle has to catch the hare. One person is the turtle, and they must get down on all fours and curl themselves into a ball. Then they roll around the trampoline trying desperately to find the hare. If you haven't guessed by now the other player is the hare. They can do one of two things. They can get down on all fours and bounce around the trampoline trying to avoid the turtle. Or they can stand and jump around, and do their best to keep away from the turtle. Much like tag, if the turtle happens to catch the hare then the players switch places and play again. Trampolines can be a fun way to spend time with your friends and family. They are also very good for your health. 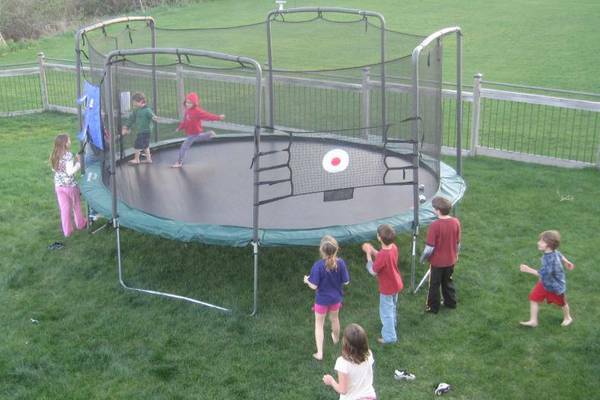 Games that are played on the trampoline can be extremely fun and enjoyable for all ages. Much like these 2 person trampoline games. If you also like trampoline tricks, don't forget to visit our cool trampoline tricks page.